Nearby are both The Shuttleworth collection with its museum and airfield and also the Cardington hangers, that once housed the great airships. All microlight experiences start with a pre-flight briefing where you will be shown the microlight aircraft, its main characteristics and have the basic principles of flight explained to you - all really interesting stuff even before you've taken to the air! Then once securely strapped in, the instructor will handle the take off and climb. Having settled down in level flight your pilot will demonstrate a few gentle turns and you may be given the opportunity to try for yourself. You might not believe us now, but you'll find it's really quite easy (yet still totally thrilling!) to actually fly the aircraft yourself. 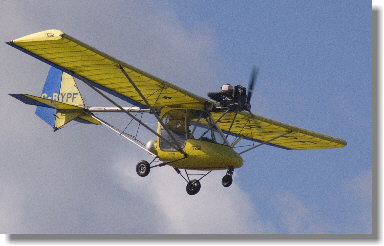 As with all Bedford Microlight flying activities, all aircraft we use comply with the British Civil Airworthiness Requirements issued by the CAA to regulate each aircraft, the manufacturer and pilots. 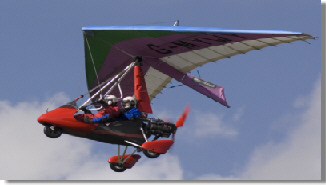 We fly Microlights throughout the year and all equipment Flying suits, Helmets and Gloves are provided. The minimum age for microlighting is 14 years old, there is a maximum weight limit of 89-110kg (14-16½ stone) depending on the Aircraft. Spectators are most welcome to come along to the airfield to watch the fun. There is a decking area to view the flying from and most weekends the cafe is open for tea, coffee, and bacon sandwiches.